HONOLULU (AP) — Six NASA-backed research subjects who have been cooped up in a Mars-like habitat on a remote Hawaii volcano since January emerged from isolation Sunday. They devoured fresh-picked tropical fruits and fluffy egg strata after eating mostly freeze-dried food while in isolation and some vegetables they grew during their mission. “It?s really gratifying to know that the knowledge gained here from our mission and the other missions that HI-SEAS has done will contribute to the future exploration of Mars and the future exploration of Space in general,” science officer Samuel Paylor said Sunday. While isolated, the crew members wore space suits and travelled in teams whenever they left their small dome living structure. They ate mostly freeze-dried or canned food on their simulated voyage to Mars. During the eight months in isolation, mission biology specialist Joshua Ehrlich grew fresh vegetables. “Carrots, peppers, pak choy. Chinese cabbage, mustard greens, radishes, tomatoes, potatoes tons of parsley and oregano, I mean it was phenomenal, just that delicious fresh taste from home really was good,” Ehrlich said. All of their communications with the outside world were subjected to a 20-minute delay — the time it takes for signals to get from Mars to Earth. The crew was tasked with conducting geological surveys, mapping studies and maintaining their self-sufficient habitat as if they were actually living on Mars. The team’s information technology specialist, Laura Lark, thinks a manned voyage to Mars is a reasonable goal for NASA. The project is the fifth in a series of six NASA-funded studies at the University of Hawaii facility called the Hawaii Space Exploration Analog and Simulation, or HI-SEAS. NASA has dedicated about $2.5 million for research at the facility. The crew played games designed to measure their compatibility and stress levels and maintained logs about how they were feeling. To gauge their moods they also wore specially-designed sensors that measured voice levels and proximity to other people in the, 1,200 square-foot (111-square meter) living space. The devices could sense if people were avoiding one another, or if they were “toe-to-toe” in an argument, said the project’s lead investigator, University of Hawaii professor Kim Binsted. The study also tested ways to help the crew cope with stress. When they became overwhelmed, they could use virtual reality devices to take them away to a tropical beach or other familiar landscapes. 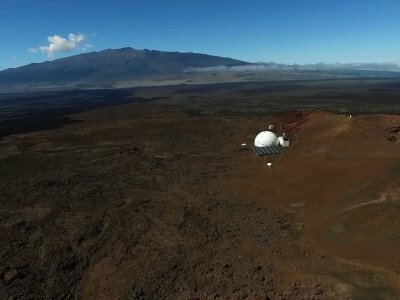 Other Mars simulation projects exist around the world, but Hawaii researchers say one of the chief advantages of their project is the area’s rugged, Mars-like landscape, on a rocky, red plain below the summit of Mauna Loa. The crew’s vinyl-covered shelter is about the size of a small two-bedroom home, has small sleeping quarters for each member plus a kitchen, laboratory and bathroom. The group shared one shower and has two composting toilets.